Coprinus leiocephalus P.D. Orton in Notes R. bot. Gdn Edinb. 29: 88. 1969. Sel. icon. - Imazeki, Otani & Hongo, Fungi of Japan: 208. 1988. Sel. descr. & figs. - Bender & al., Bender, APN-Mitt.Bl. 7(1): 37. 1989; Orton in Notes R. bot. Gdn Edinb. 29: 88. 1969; Uljé & Bas, Persoonia 13: 440. 1988. Pileus 5-25 x 3-15 mm when still closed, 15-50 mm wide when expanded, first ellipsoid or ovoid, then campanulate to convex, finally flattened, sulcate-striate up to centre, sordid yellow-brown, cinnamon to (rarely) reddish-brownish (Mu 7.5 YR 4/6-5/8; 10 YR 4/6, 5/5-6; 2.5 Y 6/4; K. & W. 6C4, 6D2, centre 7D7/E7), usually rather pale. Lamellae, L = 21-48, l = 1 -3, free, c. 1-2 mm remote from stipe, whitish, then grey-brown to blackish. Stipe up to 140 x 1-3 mm, with slightly bulbous base, whitish to pale, sordid yellowish-brownish. Spores 8.1-11.8 x 7.1-10.5 x 5.3-7.0 µm, Q = 0.95-1.40, av. Q = 1.05-1.30, av. L = 9.0-10.7, av. B = 8.1-9.8 µm, mainly 5-angular and heart-shaped with apical papilla, lentiform, with eccentric germ pore and convex to flattened base and rounded apex, dark red-brown. Basidia 20-40 x 9.5-12 µm, 4-spored, surrounded by 4-6(-7) pseudoparaphyses. Pleurocystidia 50-110 x 25-35 µm, upper part 16-23 µm, (sub)utriform or subcylindric. Cheilocystidia 30-80 x 14-30 µm, utriform or lageniform with 6-15(-18) µm wide neck, also ellipsoid or ovoid ones. Pileipellis smooth, hymeniform, made up of spheropedunculate cells, 20-28 µm wide. Clamp-connections present. Terrestrial on bare, often clayey soil or at grassy places, particularly under trees and shrub but also on lawns and meadows; moreover rather frequent on paths covered with woodchips. Solitary or a few together, in small groups. Very common. Wide-spread in Europe and probably other continents. 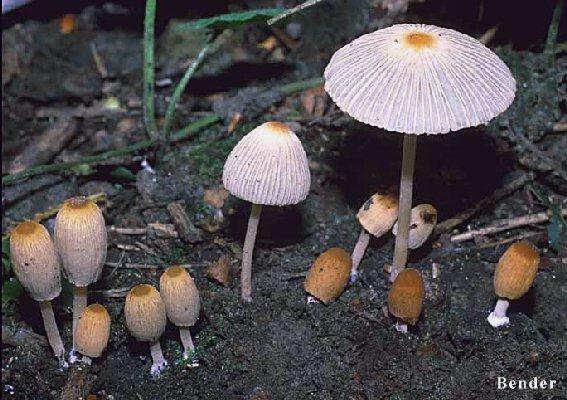 Coprinus leiocephalus can be distinguish with certainty only microscopically from most other close related species. The most close species are C. lilatinctus, C. plicatilis and C. kuehneri. 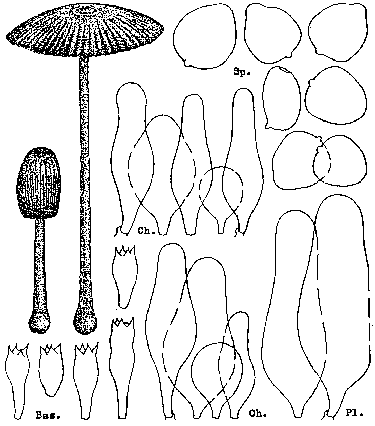 The similar shaped spores in C. lilatinctus are distinct larger, those in C. plicatilis are more elongate, larger but not broader. In C. kuehneri the spores are smaller and triangular.